The Rockport Film Review: A little Story about "Jack and Diane"
A little Story about "Jack and Diane"
Writer/director Bradley Rust Gray's debut feature "The Exploding Girl" was a mild indie success with its star Zoe Kazan, a twenty-something girl dealing with life and relationship issues. It's a slow burn character study that felt very real and relatable and looked to be a good starting point for the young filmmaker. His follow up film "Jack and Diane" is here and it has taken a pretty vicious critical beating. It stars current "It" girl Juno Temple and Riley Keough in a brief but intense affair, that includes metaphoric intercut with a werewolf-like beast. The film also features brief stop-motion tidbits from the brilliant Quay Brothers. In some ways, I think it has been unfairly picked on and doesn't deserve such a thrashing. 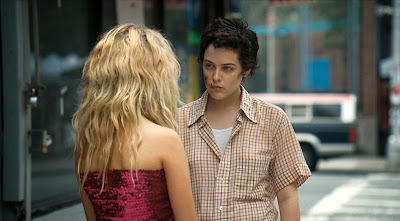 Diane (Temple) is a British girl in New York City who while trying to find a phone runs into Jack (Keough) the stereotypical tomboy. The two girls are complete opposites. Diane is tiny, meek and insecure. While Jack puts up a tough and rigid exterior, full of false self-confidence. After partying the night before, Jack is hit by a car while on her skateboard and for the rest of the film she has a nasty scrape on the side of her face. We find out both characters are caring around some heavy emotional baggage. Diane has frequent nosebleeds and strange dreams about a big nasty beast ripping people apart, but this is by no means a horror movie. The animated sequences are thick strands of hair moving around the inside of a persons body like a rope tightening around a heart. It's sticky, grimy and a little gross, but then again so are some of the critics. Early on in their relationship Jack finds out that Diane is leaving for Paris in a few weeks and she tries to distance herself and forget everything about her, but she can't. Eventually, they start to embrace the time they have left together. The film does feel a little awkward and strange but then again this is what the characters are feeling. The story also meanders and goes in a few different directions but overall I didn't find it annoying. Towards the end of their time together Jack starts getting the nosebleeds and having these awful visions almost like Diane infected her with something. I know I'm in the minority on this but I kind of dug the film. It's currently available on Netflix watch instantly, so take a chance and give it a watch. Stephen King's Original "Children of the Corn"